Liberty's Door Panel Organizer Pistol Kit for Gun Safes Vault Accessory 30-35-40 Model 10586. Do you ever feel like you need a bigger safe? Does it often seem that no matter which way you organize your valuables there just never seems to be enough space? Imagine if you could clear off the shelves and have more room for those items that truly need to be on the shelf. Well good news, because now you can with the Liberty Door Panel Organizer Pistol Kit 30-35-40. Our friends over at Liberty have come up with the perfect solution to efficiently and effectively store your handguns, important documents, and other small valuables. When it comes to Door Panel Organizers getting the right fit and style for your Gun Safe is crucial. The Liberty Door Panel Organizer Pistol Kit 30-35-40 comes equipped with 8 pistol holsters, Zip Pockets, Choke Tube Holders, and Cool Pocket. The Cool Pocket is designed to give you extra fire protection up to an additional 50 degrees! It will attach to any interior door of a safe that has a 5/8 inch thick door panel and uses six clips two on the top and two on each side to attach. It can hold from 40 to 70 pounds depending on the size of the panel. This model the 30-35-40 measures 25-1/2 inches wide by 49 inches tall and will fit on any interior safe door that measures a minimum of 27-1/4 inches and no wider than 32 inches. 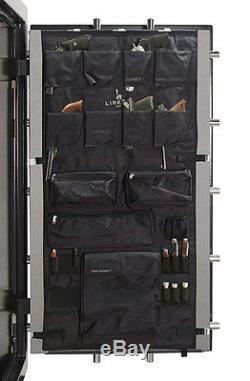 Features of the Liberty Door Panel Organizer 10586 for 30-35-40 Size Gun Safes. Actual size of the accessory door panel is 25-1/2"w x 49"h.
Fits interior safe door measuring at least 271/4 inches wide and no more than 32 inches wide. Please measure the inside of your safe door panel from side to side before you order to determine the proper size needed. Two COOL POCKETS (extra fire protection). The item "Liberty's Door Panel Organizer Pistol Kit 30-35-40 Gun Safes Vault Accessories" is in sale since Wednesday, September 4, 2013. This item is in the category "Sporting Goods\Hunting\Gun Storage\Cabinets & Safes". The seller is "dean_safe_company" and is located in Pacoima, California.